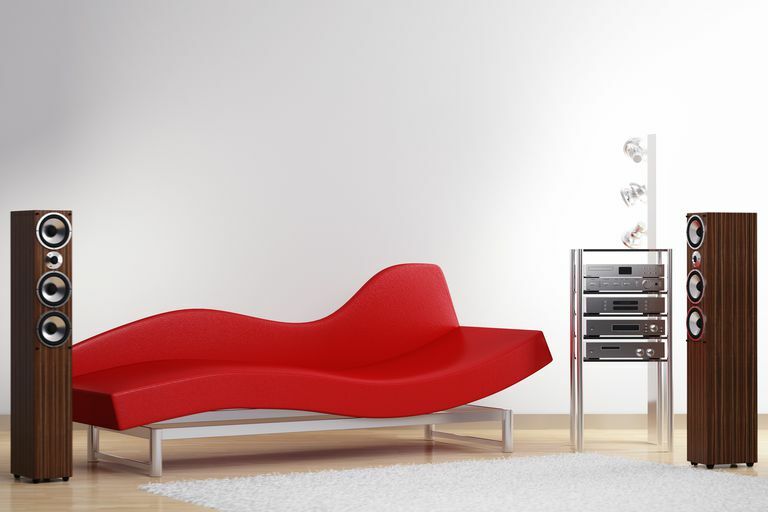 Whole house audio systems – also known as multi-room or multi-zone – have become increasingly popular over the years. With a little bit of planning and an open weekend to start and finish the project, you can have full control over how music plays throughout the entire home. There are several methods and technologies to consider when it comes to distributing audio, each with their own benefits and challenges. As such, it can seem a little intimidating to figure out how all the pieces come together harmoniously, be them wired, wireless, powered, and/or non-powered. You probably already own some equipment, such as stereo speakers and a quality home theater receiver. The next step is to plan what your multi-room system will look like before expanding and harnessing features to cover additional areas. Read on to get an idea of the various ways to get the job done. The simplest way to create a two-zone stereo system is likely right at your fingertips. Many home theater receivers feature a Speaker A/B switch that allows a connection to a second set of speakers. Place the additional speakers in another room and install speaker wires leading to the receiver's Speaker B terminals. That's it! By toggling the A/B switch, you can choose when music plays in either or both areas. It is also possible to connect even more speakers to the receiver by using a speaker switcher, which acts as a hub. Just remember that while it may be multi-zone (different areas) it's still single-source. You'll want to set up a multi-source system to stream different music to different rooms/speakers simultaneously. If you own a newer home theater receiver, you can harness its multi-room/-source features without the need to incorporate a switch. Many receivers have additional outputs that can provide two-channel audio (and sometimes video) to as many as three separate zones. This means you can have different music/sources playing in different areas instead of all speakers sharing the same one. In some models, the audio output is speaker level, which needs only lengths of wire connecting to all other speakers. But be sure to check carefully. Some receivers use an unamplified signal, which requires line-level cables and an additional amplifier between rooms and extra speakers. A multi-zone control system is essentially a switch box (like the speaker switcher) that allows you to send a selected source (e.g. DVD, CD, turntable, media player, radio, mobile device, etc.) to a specific room(s) in your home. These control systems can send either line-level signals to an amplifier(s) located in select room(s), or they can feature built-in amplifiers that send speaker-level signals to the selected rooms(s). No matter which type, these control systems allow you to listen to different sources simultaneously in different zones. They are available in many configurations, often ranging from four to as many as eight or more zones. Those fortunate enough to own a home with network wiring already installed throughout can enjoy a significant advantage. The same type of cables (CAT-5e) used to connect a computer network system can also distribute audio signals to multiple zones. This saves a great deal of work and time (as long as speakers have or can be equipped with the connection) because you don't have to worry about running wires (i.e. measuring lengths, drilling holes, etc.) all over. You just need to place speakers and connect to the nearest compatible port. Although this type of wiring is capable of distributing audio signals, it cannot be used simultaneously for a computer network. However, you can use your computer to distribute audio over your wired home network in the form of digital audio files, internet radio, or online streaming services. This is a low-cost solution, especially if you already have a computer network installed. If you don’t have a pre-wired home and if retrofit wiring is too much to consider, then you might want to go wireless. Wireless technology continues to make steady improvements, offering users a comprehensive experience that can also be reasonably easy to set up. Many of these speaker systems use WiFi and/or Bluetooth – some can feature additional wired connections – and often come with mobile apps designed for convenient control through smartphones and tablets. It ends up being fairly simple to add and configure additional speakers. But one notable limitation to using wireless speakers is compatibility; most wireless speaker systems are made to work/pair only with others by the same manufacturer (and sometimes within the same product family). So unlike wired speakers that are brand/type agnostic, you can't simply mix and match wireless speakers and achieve the same seamless results. Wireless speakers can also be more expensive than the wired kind. If you're hooked on the idea of wireless audio, but don't want to replace your perfectly capable wired speakers with the wireless kind, a digital media adapter may be the way to go. These adapters bridge a computer or mobile device to a home theater receiver either by WiFi or Bluetooth wireless. With the receiver set to the input source of the adapter (typically RCA, 3.5 mm audio cable, TOSLINK, or even HDMI), you can stream audio to any room(s) that have speakers wired up to the receiver. While it's possible to use multiple music adapters to send separate audio signals to different sets of speakers (i.e. for multi-zone and multi-source), it can end up more complicated than it's worth. Although these digital media adapters work well and are highly affordable, they're often not as robust in terms of features and connectivity like with control systems.